Spaces location in Kirby Grove offers modern office space. 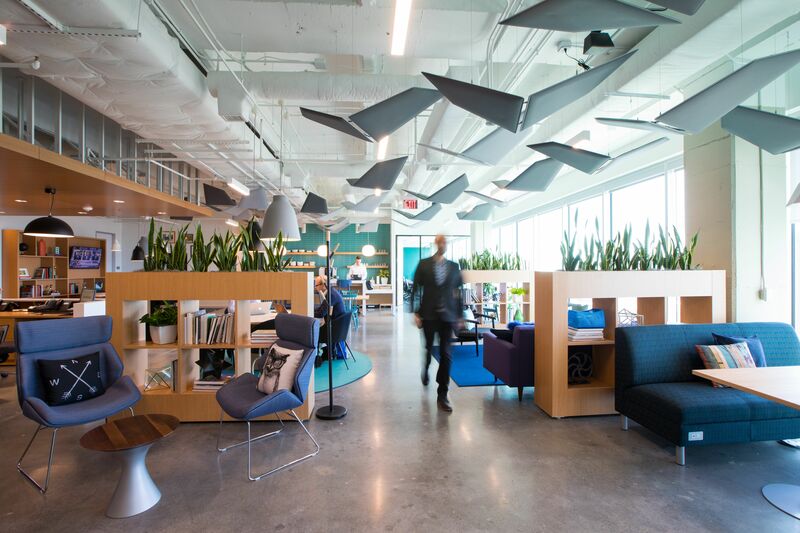 HOUSTON – (Realty News Report) – Spaces, an international force in the “co-working” segment, is opening two new office locations in Houston, according to Midway. Spaces, described as a creative flexible workspace pioneer, is leasing space in downtown in Houston’s Innovation Corridor at GreenStreet in downtown at 1201 Fannin. Spaces leased 63,000 SF in GreenStreet, a Midway mixed-use development covering four blocks on the east side of Main Street. Spaces also leaded 60,789 SF in at CITYCENTRE One, 800 Town & Country Boulevard. CITYCENTRE is a mixed used project developed by Midway near the intersection of the Katy Freeway and Beltway 8. Both of the new Spaces locations will be centered around “the concept of community and shared ideas,” Spaces said in a statement. Spaces was represented in both leases by brokers Mike Cleary, Senior Vice President, Kevin Saxe,Sr. Vice President, and Kevin Kushner, Senior Vice President with CBRE. GreenStreet was represented by Damon Thames, Vice President, Connor Saxe, Director, and Vince Strake, Leasing Representative with Colvill Office Properties. CITYCENTRE was represented by Michael Anderson, Executive Vice President, and Connor Saxe, Director, with Colvill Office Properties. Last week, a startup accelerator ground called MassChallenge announced it was opening a facility for entrepreneurs in the GreenStreet project. Venture capital investors are often attracted to startups in the MassChallenge program. A recent report from Startup Genome and the Global Entrepreneurship Network identified the disruptive, creative potential in innovation ecosystems like Houston’s, where emerging technology entrepreneurs collaborate with established industry leaders. Spaces originally entered the Houston market in another Midway development, Kirby Grove, which is near the intersection of Kirby Drive and Richmond Avenue in Houston’s Inner Loop. “We are excited Spaces has selected two more Midway properties after launching in Houston at Kirby Grove on Levy Park,” said Chris Seckinger, Vice President, Investment Manager for Midway. Spaces GreenStreet will offer workspace community with collaborative areas, team rooms, co-working space, phone booths, meeting rooms, fully furnished private offices and a 3,000-SF rooftop patio. The GreenStreet Lawn also offers an outdoor community gathering place for live music, alfresco dining and relaxed networking. In addition to restaurants, shops, local art installations and an ever-changing lineup of events, GreenStreet is home to upscale Hotel Alessandra and the House of Blues concert hall. Spaces CITYCENTRE will be located in almost 61,000 square feet in the CITYCENTRE One office building, in the heart of a mixed-use environment of retail, restaurants, fitness, offices, residences and welcoming green space. The award-winning CITYCENTRE district has been honored as “People’s Choice Development of the Decade” by the Urban Land Institute. Spaces members also will enjoy access to a global network of more than 3,300 flexible workspace locations worldwide. Spaces has locations in the United States, Europe, Canada, Latin America, Africa, Australia and Asia.